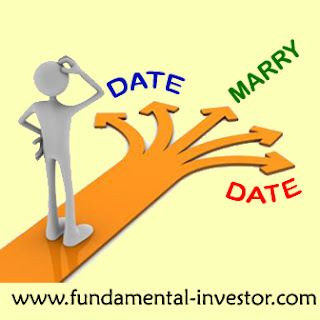 Fundamental Investor: One Night Stand in the Stock Market !!! As I write this article, Nifty and Sensex are hitting new highs. Most of the traders and investors are sitting on good profits. Most of the analysts are bloating on their success stories of stocks becoming multi-baggers. Many companies, irrespective of their fundamental strength, are moving up very strongly. In the recent past, Technical Analysts' minimum target is scaling up to 2x of current price. Many unknown stocks which were ot followed are breaking out from multiyear consolidation. Every IPO is giving returns and putting the listing price to shame. At this time, when the market is becoming over optimistic and enjoying the bull run, I thought of writing about a subject which is apt. Kiran is a Fundamental Investor in this Bull Market. She researches on a company called "My Research Ltd (MRL)" which she understands well and she prepares long notes covering each and every aspect of the business. She looks at promoter integrity, balance sheets, current debt, past growth, future potential and the price multiple of the share price. She also compares the business with its peers and finds a huge valuation gap. She tries to see whether the business can scale up extensively in the near future and tries to value the company. After spending 3-4 months on research she takes a position by allocating a solid portion of portfolio on the business. A month passes. No movement in her stock. It is down 15%. It is consolidating very well but Kiran is unable to look at that. She is only seeing RED in her stock. Suddenly a friend pings her and informs about another company "Not My Research Ltd (NMRL)" and tells her that it is going to really move up. Kiran now starts researching into NMRL and starts preparing notes in the same way. As she is researching, NMRL moves up 5% while her MRL goes down. She now makes a quick decision. She sells MRL with a 17% loss and buys NMRL. NMRL moves up 2% after her buy and she is so happy. Immediately, NMRL consolidates and surprisingly it also comes down a little. After a month, her initial company MRL moves up by 50%. She feels devastated. Another friend talks to her about another company called "Its Hot and Fast Ltd (IHFL)" and now Kiran starts researching this. She finds IHFL more interesting than NMRL and ends up selling NMRL to buy IHFL. This story continues. Is there a Kiran in each of us? How many of us actually stick to our research of a business and hang on with our investment? In today's highly connected world, we hear about exciting business stories every single day. With so much information, we keep hearing of new cheap stocks and our mind is always on the lookout for something better. And we always feel that the grass is greener on the other side. We fail to hang on to our conviction and keep believing that other stocks are better than ours. Also, everyone seems to be earning money except us. Let us stop looking at how others are doing. Most of the people only talk about their success stories but fail to look at the losses and the charges paid on every short term trade. There are thousands of opportunities out there which will make money for us. We fail to understand that we only need one solid idea or business which we understand to make wealth for us. We try to take part in all business stories and end up never milking any business to the fullest. 1) Try to research a stock to the fullest. Try to gather as much information as possible and see if there is enormous growth available ahead. With future growth, stock price will also rise. 2) Take your time before allocating capital. Once capital is allocated to the stock, and if the stock is performing as per guidance, do not lose faith in the business. Even if the stock falls, do not bother. 3) Once you are invested in a story, try to research the existing story further and see if you have missed anything. Do not try to research other new stories until you know everything about the existing business. 4) If a few businesses which you have researched play out well, you will become much more wealthier than trying to play each and every business which is moving up. 5) And lastly, you DO NOT need to know each and every business in the market. No one can become an expert in all businesses. Try to identify a few which you can relate to. I am not saying that you should not research new businesses or stories. Being informed is one thing. But losing focus on the existing and looking out for new businesses just is not worth. Don't move from one WINNER to another. It is worse if you move from a WINNER to a stock which looks like a WINNER. In this bull run, there are lots of good companies which are overvalued and a hell lot of bad companies which are crazily overvalued. With research you can separate the progressive ones from the junk. With conviction, take the leap and enjoy the run. Too much research in too many companies can be injurious to your investment career !!! Now, dating or marrying - Its your choice !!! Manjunath here working as an engineer. Though I have read many of your posts on MMB wrt PEL, only today got to know this website of yours. Just read this article an its amazingly written in simple words which anyone can understand. I have become a fan of yours with this one article. Will go through your other articles (Even liked your views : to treat the Equity as 3rd child). Thanks a lot, would like to keep in touch with you. Thanks Manju. You can send me an email anytime to keep in touch. You will find my email link in About FI page on top. Thanks.